Put the dark chocolate chips in a glass bowl or measuring cup and microwave for 1 minute. Take out, stir, and if the chips aren't completely melted put it back in the microwave in 15 second bursts, stirring in between, until the chocolate is glossy and lump free. Spread out the chocolate into approximately a 9x12 rectangle on a baking sheet that's been lined with parchment paper or a silpat liner. The lining is important because you will need the bark to come off easily once it has hardened. Spread out the chocolate as evenly as you can; an offset spatula works well for this. Let the layer of chocolate harden. You can set it aside, or put the tray in the refrigerator for about 30 minutes. Melt the white chocolate in the same way, and spread it out evenly over the dark chocolate. Note: If you have had trouble melting white chocolate in the past, you can play it safe and use a double boiler. Bring a pan of water to a boil, and set a bowl over it, being sure no water gets into the bowl. Lower the heat and melt the chocolate over the simmering water, stirring constantly. 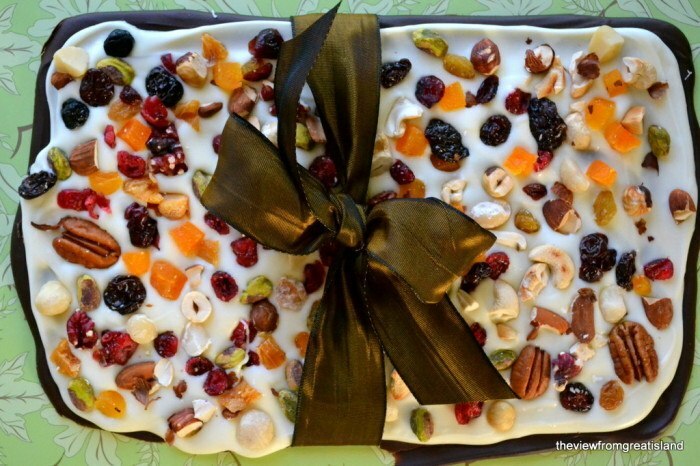 While the white chocolate is still warm, scatter the fruit and nuts evenly over the entire surface. Press down gently to insure that they stick as the chocolate hardens. Set aside to harden at room temperature, or place in the refrigerator. Cut into pieces, or leave whole.